A comprehensive introduction to the study of language and linguistics, An Introduction to Language 6/e covers all the major topics in linguistics* phonetics, phonology, morphology, syntax, and semantics as well as pragmatics, historical change, social and regional dialects, child language, writing, language processing, and the neurobiology of language. The comprehensive approach uses humour to enhance student interest in the diverse study of language from its origins to current areas of research and discovery. Features* * Covers all the major topics in linguistics* phonetics, phonology, morphology, syntax, and semantics as well as pragmatics, historical change, social and regional dialects, child language, writing, language processing, and the neurobiology of language. * Exercises and data problems give students the chance to perform in-depth analysis of human language structures. * Improved glossary makes technical terms easy to locate and understand. * Text uses cartoons and quotations from literature to heighten interest and clarify complex topics. ;New to this edition* * Reorganization of chapters starts with studies of the brain as the key to understanding the nature of language structure, piquing the student's natural interest and making this a viable textbook for programs in cognitive science. * Up-to-the-minute material included in a new chapter on the brain and language, including PET and MRI scans of patients by foremost neurologist, Dr. Hanna Damasio. * How to sections have been added to provide students with procedures for phonological and morphological analysis. * The sign languages of the deaf are now discussed throughout the book (rather than in an isolated section) showing how all languages--signed and spoken--share universal features. * Chapters on child language acquisition, psycholinguistic studies of language processing, and computer processing of natural language have been updated. * Expanded chapter on Latino English. * Chapters and sections on semantics and pragmatics have been expanded. * The study of syntax and phonology has been revised to be less formal, emphasizing substantive characteristics of languages of the world. 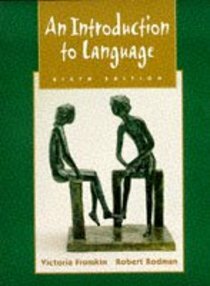 About "Introduction to Language (6th Edition)"